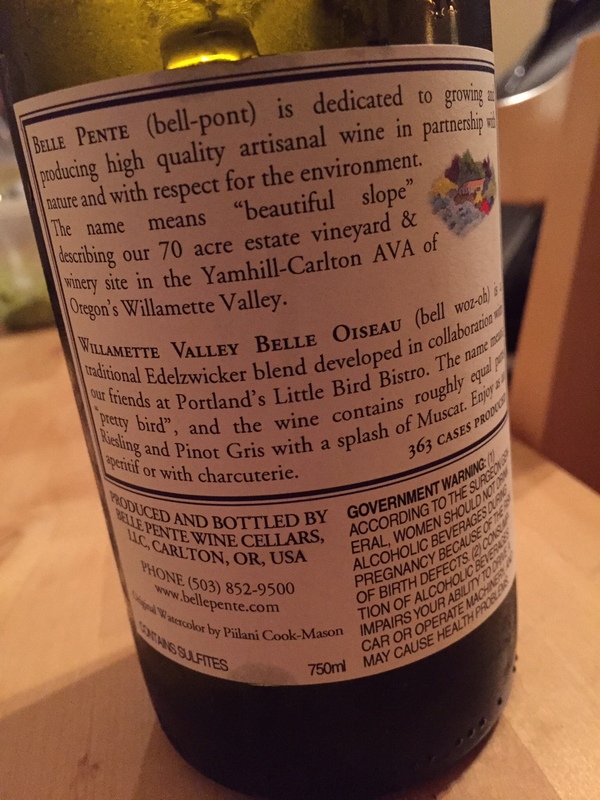 Thirty Oregon Wines in Thirty Days, day 26: Belle Oiseau! Belle Waz-what? | the wine snob. Thirty Oregon Wines in Thirty Days, day 26: Belle Oiseau! Belle Waz-what? 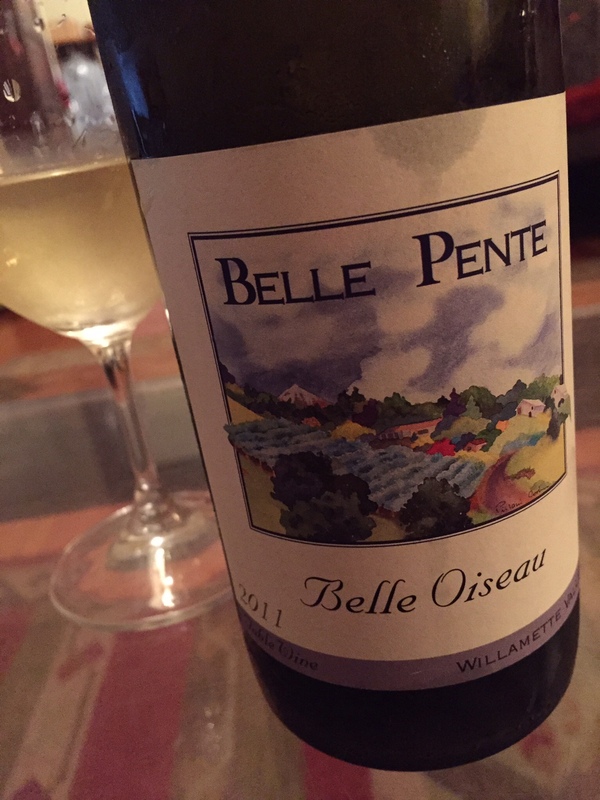 Behold, one of my favorite Oregon whites, the Belle Pente Belle Oiseau, 2011! Belle Oiseau means “Pretty Bird.” Also, Belle Waz-Oh. As it turns out, this wine is beloved by many Oregonians. And with due reason. Winemaker Brian O’Donnell developed this wine for Portland’s Le Pigeon and its little sister restaurant, Little Bird, with the help of General Manager/Partner Andy Fortgang. Le Pigeon and Little Bird Bistro are currently taking two out of my top five spots for drool-worthy Instagram feeds here in Portland, by the way. I seriously can’t wait to go to either one. 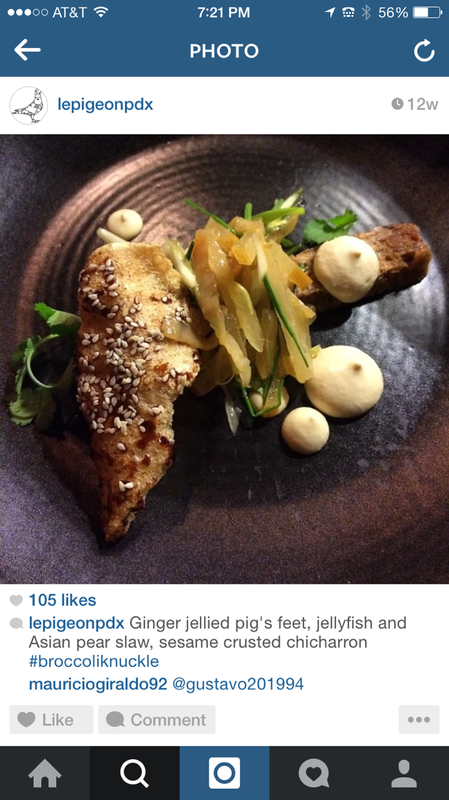 Sometimes they Instagram their staff meals, too. I might just show up sometime roughly when I suppose a staff meal would take place. I’m sure they’d love that. I mean, seriously. I can’t even. How good would this wine be with this?! In any case, this wine was developed as an ode to an Alsatian “Edelzwicker”, a blend of “Noble” varietals. Historically, the grapes would all come from the same parcel, and could even be co-fermented. The 2011 vintage is a blend of mostly Pinot Gris and Riesling, with a bit of Muscat. I’ve had it on a few occasions, but this is the first bottle I’ve purchased for just me. And let me tell you. The more time I spend with this bottle, the more enamored I am with it. On a given Tuesday, I could open a bottle, drink a glass, then say to myself- ok, later for that. But this is the kind of wine where I find myself sneaking another half a glass… then another. Its like an old friend. You can keep coming back to it, and every time you do you’re reminded how much you like it. A very dry wine with just a touch of RS, it drinks like a lean, clean little machine. Delicate and precise, is has defined stone fruit and white floral characteristics, with soft lemon and golden apple in the background. Sharp enough to cut through something fatty (this wine was developed specifically with charcuterie in mind), yet would be great with light, fresh fare (oysters, anyone?) as well. The finish is lifted with some higher aromatics of jasmine and fresh laundry. Of course I’ve already declared my clear personal bias for Belle Pente, but this really is one of my favorite Oregon whites. Originally, this wine was restaurant-only, and sold in keg form. I read in one article that it sold for $8 a glass and $20 for a half-lifer carafe- which is RIDIC- in a perfect way. So well-priced. I would love to share a carafe of this wine, bistro-style, for $20. It sounds too good to be true to me. In any case, this wine in bottle form sells for $18. I purchased it at the winery, and honestly I don’t know if any retailers carry it. They very well could, I just don’t know personally. If you’re local, I of course suggest bringing yourself down to Carlton to buy some at the winery. If you’re not, you’ll have to get a plane ticket. But its cool, you’ll be happy you did. Gah! I know I’m a day behind right now, but I’m trying my best to wrap up the Thirty Grapes project in the best way possible. Seriously, I’m TRYING. Cheers! ← Thirty Oregon Wines in Thirty Days, day 25: Vermentino in Oregon? !